307 LANGENES, B. Normandia. Amsterdam/Francfort, 1609. Infimes rousseurs. 84 x 124 mm. 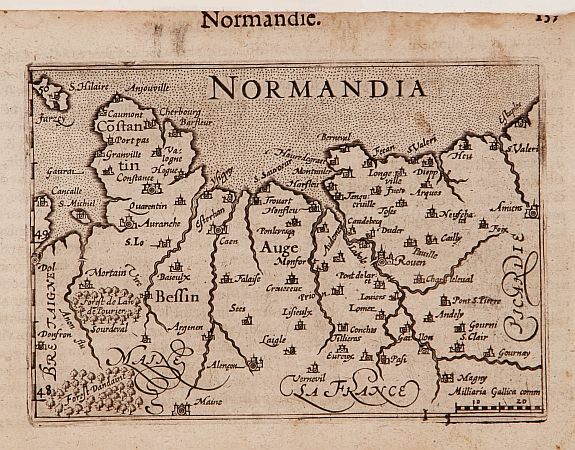 � A miniature map of Normandy. First published in 1598 in his "Caert-Thresoor", the plates were executed by the most famous engravers in Amsterdam, including Petrus Kaerius and Jodocus Hondius I. "The atlas set a new standard for minor atlases. The small maps is extremely well engraved. The map reflect the level of cartography in Amsterdam at the turn of the century, where up to date information on newly discovered regions was readily available". 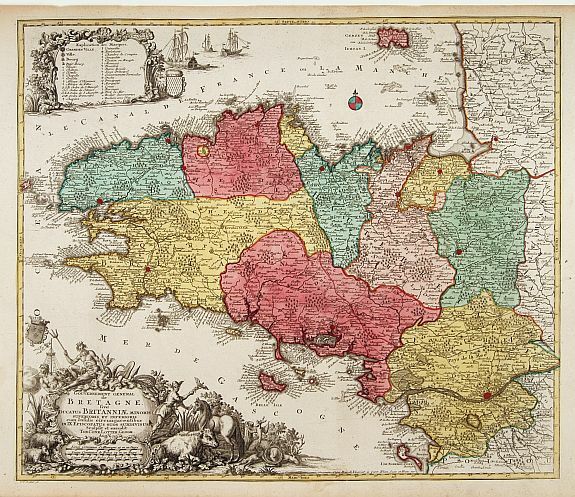 308 BLAEU, G. Normandia ducatus. Amsterdam, 1635. Beau col. ancien. Petite fente en bas le long du pli central. Papier l�g�rement jauni. 377 x 514 mm. � Very detailed map of Normandy centered on Caen and Rouen. Also showing Cherbourg, Avranches, Bayeux, Cabourg, Honfleur, Le Havre, Etretat, Fecamp. St Malo and Mont Saint Michel appear in the lower left corner. Title cartouche held by two cherubs. The map is also embellished with a coat of arms, several sailing ships, a windrose and a sea monster. 309 LANGENES, B. Britannia. Amsterdam/Francfort, 1609. Infimes rousseurs. 84 x 124 mm. 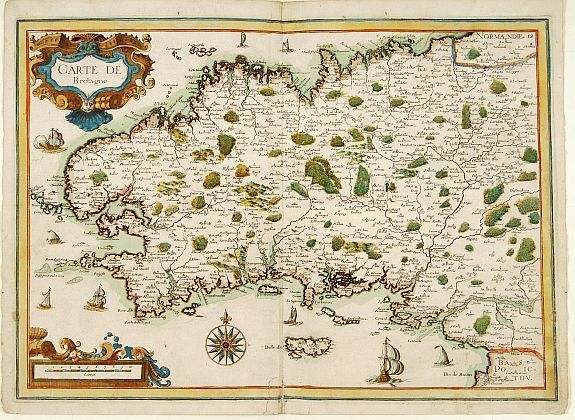 � A miniature map of Brittany. Title cartouche in the lower left corner. First published in 1598 in his "Caert-Thresoor", the plates were executed by the most famous engravers in Amsterdam, including Petrus Kaerius and Jodocus Hondius I. "The atlas set a new standard for minor atlases. The small maps is extremely well engraved. The map reflect the level of cartography in Amsterdam at the turn of the century, where up to date information on newly discovered regions was readily available". 310 TASSIN, N. Carte de Bretagne. Paris, 1634. Beau col. ancien. Infimes mouillures. Belle impression, bien contrast�e. Petite consolidation en bas du pli central. 370 x 510 mm. � Rare en coloris d'�poque. Premi�re �dition. 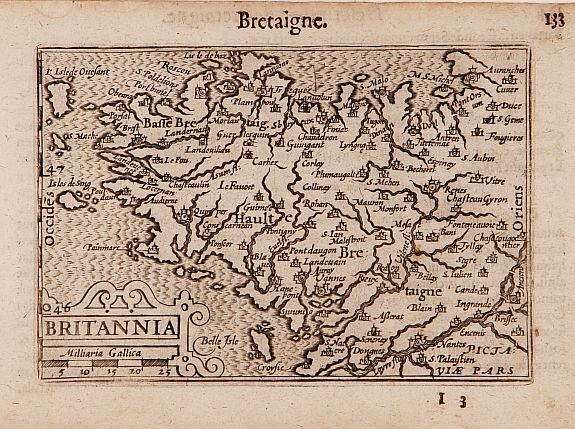 Very fine and detailed map of Bretagne. Embellished with decorative title and scale cartouche, a beautiful wind rose and several sailing ships. 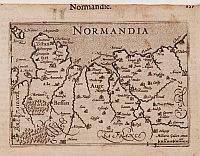 Nicolas Tassin, who was active from 1633 till 1655, was appointe"royal cartographer" at Dijon before setting up as an engraver in Paris where he issued various collections of small maps and plans of France, Switzerland, Germany and Spain. Maps by Tassin in original colours are rare. With a plate number 12, in upper right corner. 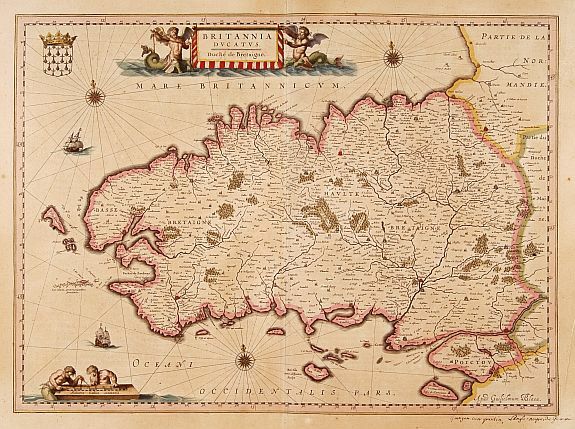 311 BLAEU, G. Britannia Ducatus/ Duch� de Bretaigne. Amsterdam, 1635. Beau col. ancien. Papier l�g�rement jauni. 379 x 520 mm. 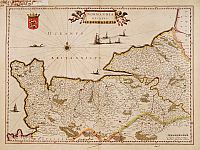 � Very detailed map of Bretagne. Mont-Saint-Michel appears near the top right. Includes many decorative elements such as three wind roses, two finely engraved sailing boats, coat of arms of the Duchy, two tritons [supporters of the God Neptune] engaged in using dividers on the scale of miles and also two tritons holding the sign of Brittany. 312 LOTTER, T. C. Gouvernement G�n�ral de Bretagne. Augsbourg, 1770. Beau col. ancien. Bel exemplaire. 495 x 580 mm. � Beau cartouche d�coratif et �chelle. T.C. Lotter married M. Seutter's daughter in 1740 and succeeded him in 1756. Lotter used the copperplate of Seutter; he only changed the name. 315 DEPOT GENERAL DE LA MARINE. Carte particuli�re des c�tes de France (Entr�e de la rade de Brest et partie m�ridionale du chenal du Four). Paris, 1824. Belle impression. 592 x 875 mm. Carte maritime de la rade de Brest. 316 DEPOT GENERAL DE LA MARINE. Carte particuli�re des c�tes de France (Entr�e du port de Lorient, Ile de Groin, anse du Pouldu, entr�e de l'Aven et basse jaune. Paris, 1824. Belle impression. 592 x 883 mm. Entr�e de l'Aven jusqu'� Lorient, avec l'�le de Groix. 317 DEPOT GENERAL DE LA MARINE. Carte particuli�re des c�tes de France (Entr�e du port de Lorient, Presqu'�le de Quiberon et partie septent.le de Belle-�le). Paris, 1824. Belle impression. 882 x 590 mm. 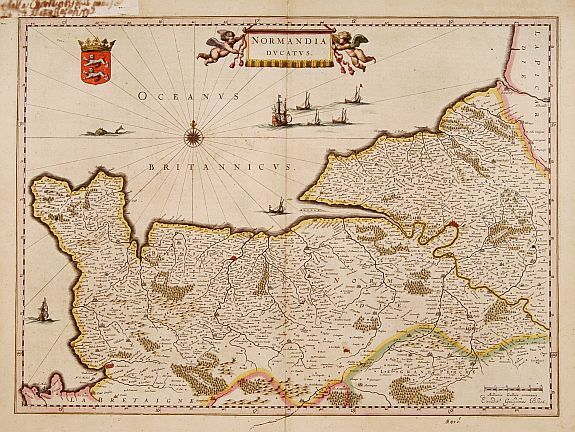 Carte maritime centr�e sur Lorient, la Presqu'�le de Quiberon et le nord de Belle-Ile.